Starting tonight, Bunnell will have the most restrictive panhandling rules in the county. The Bunnell City Commission is set to approve, on second reading, an ordinance tailored after that of St. Augustine, one of the strictest in the state. The Bunnell commission unanimously passed the ordinance on first reading on Oct. 22. St. Augustine passed its ordinance last February. Daytona Beach is crafting a similar ordinance. Palm Coast discussed the harsher approach in February but passed on it, preferring to stick with current practice, with police shooing away panhandlers when they become too aggressive, or when they break state law by, for example, impeding traffic. Arrests for panhandling are unheard of in the county. Arrests for prowling are rare. The Bunnell ordinance does not give police arresting powers if an individual is panhandling outside the city’s strictures. The Bunnell ordinance prohibits panhandling within 20 feet of entrances to any commercially zoned property, whether developed or operating business hours or not, as well as within 20 feet of bus stops (Bunnell has no public transportation stops), ATM’s, daycares, schools, any parking meter and any parking lot or public restroom operated by the city or any other government agency. The ordinance the Bunnell commission passed on first reading includes civil penalties starting at a $100 fine for a first offense, up to $250 for a fourth offense. The ordinance leaves silent whether an offender is to be penalized again for panhandling in order to pay for a fine. Florida law makes it a misdemeanor for an individual on foot to impede traffic, a provision occasionally used by cities, including Palm Coast, to regulate panhandling. But state law doesn’t address panhandling explicitly. Cities have generally been reluctant to impose stricter rules on panhandling since numerous court rulings have found panhandling to be protected by the First Amendment. “You can regulate time, place and manner, you cannot regulate content of speech,” Bill Reischmann, Palm Coast’s city attorney, told his council earlier this year. In Bunnell last month, the commission passed its ordinance on first reading with little more than anecdotal evidence that panhandling has been an issue. Commissioner John Rogers spoke of complaints, but the administration did not present documented evidence of systemic issues. Jackson today said the police chief has such evidence in the form of calls for service by residents or businesses complaining of homeless or other hygiene issues around town, though he did not have actual numbers. Jackson, as was the case with council members in late October, repeatedly said that the city was aiming for a “balancing act” to ensure that residents’ quality of life is protected while the homeless are steered, when possible, toward services–and away from businesses. He said it’s “unfair” for Bunnell to be seen as a place for the homeless. As for the city’s vulnerability to lawsuits, Jackson said: “We are trusting the guidance of our legal,” meaning the city attorney. So they’re going to “fine” people who are quite literally begging for money…kinda the pot calling the kettle black don’t ya think? This is completely disgusting and outrageous on the City of Bunnells part! These people need help! Not to be fined! Which makes absolutely no sense at all! How will someone who is too poor to eat and begging for change gonna pay a fine? Tome Foster wanting harsher penalties!? Oh yea let’s fill the jail with homeless people ,what a joke a and Mayor Catherine I am ashamed, i am big supporter of yours but this is not the values Bunnell has. These people need help, shelters, food and clothes, not fines and jail time. WWJD? Wonderful, so now everyone will come to Palm Coast! Where are Palm Coast’s strick rules against panhandling?? That’s right we have none!! Bunnell absolutely DOES have bus stops. How do you think BTMS students who live in Bunnell get to school? Why did Palm Coast decide to pass on this ordinance? Where is it written that ALL panhandlers are homeless? Or, are they just making more begging than they would on a 9-5 job where they have to pay out half o f what they make in taxes. I have seen a family (dog, baby, the whole nine yards) sitting outside of WM in Palm Coast, only to see the same bunch sitting outside of WM in St. Augustine. My daughter lives in JAX and the panhandlers are VERY aggressive and everywhere. I have given to those sitting on the curbs in Palm Coast. Food, dog food, water, blankets, etc. These are able bodied men and women who are sitting around all day smoking drinking coffee from dunkin donuts and looking at their cell phones. I now give to the Humane Society. I moved to a small community 10 yrs ago and never did I imagine that I would see homeless or deal with panhandlers every where I go & it is not ok, people purchase homes & move into this supposedly peaceful commumity in which housing prices will plummet afterall who would want to move to a place where there are homeless every where they turn? Not all panhandlers are homeless. And some choose to panhandle because they bring in more money off the books. I have given on several occasions only to see someone go and by alcohol or some other non necessity. Some are quite aggressive and walk right up to your car. I help maintain commercial properties and these people completely trash them up. We find needles beer cans and other nasty garbage. The owner ends up paying a hefty cleaning fee to avoid code enforcement penalties. How is that fair? I try to empathize with them and put myself in their place. It’s hard to do when you just gave someone 20.00 and they walk over to a new vehicle and drive off. Not sure St Augustine’s system works that great. You go down to St George street and the panhandlers are everywhere , begging for some change or trying to get you to buy some homemade craft or some guy with no shoes wants some change, and you watch him walk off the street to a parking lot and get in a modern car and drive away. I see them outside of stores and gas stations scratching lottery tickets. I have watched the same guy in palm coast beg for 4 years in that time he has upgraded his phone got a better bike and added a dog and trailer for the dog! When I was young I ran away from home due to abuse and alcoholism by parents. So I had to beg for money to eat and find places to sleep. But that was when I was like 13 years old. I see people in their 30’s, 40’s, 50’s bumming for money, only to see them leave their begging spot in a decent car. I often think, when I see them out there, if you have all day to panhandle, why not get a job. Sorry, but no no one in this country has to panhandle to eat, as there are many places to get help with getting food. Just see how pissed these people get when you offer them a sandwich…they just walk away from me. Panhandlers only panhandle in places they make money. Stop giving money to people asking, homeless or not, donate to a local charity for homelessness. People buying a panhandler a sandwich!? Are you kidding ? Who does that? Of course they dont want that nonsense, what were you thinking?! Panhandlers and homeless are a social issue that should be tended too as and after all they are our fellow Americans in bad times. There used to be panhandlers daily in Palm Coast Parkway and Old Kings Road some were young men on their 20’s, then we neighbors recognized them on their arrest records their emaciated profiles over drug issues. Some of them even in the news in drugs raids in nearby F or Palm Harbor section houses or apartments. Many have fallen into substance addiction and actually whether homeless or not rehab is not available or affordable for all. Here in Flagler County we have Pastor Silano doing all he can to feed and service those suffering hardship thru his Grace ministry and I know he started a small rehab center inside an old former chapel in Bunnell. 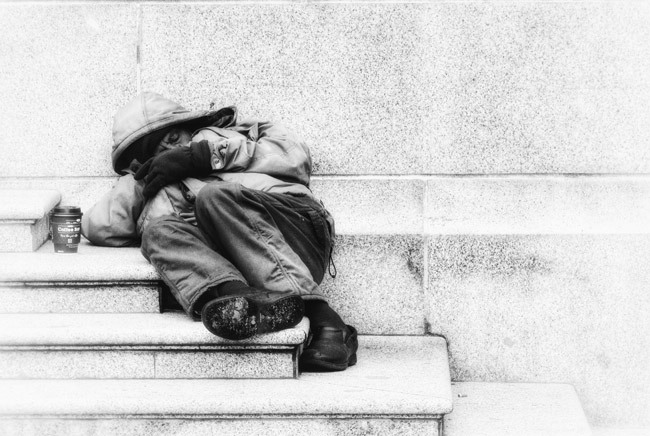 Some panhandlers/homeless have mental health illnesses and wonder untreated. The Sheltering Tree volunteers in Bunnell helps the homeless also. Actually I never seeing one panhandler around Bunnell, as I see them in Palm Coast. Have you read what that shelter in Daytona Beach is going to cost? Harshest penalties for panhandling? This from the people who insist on praying before the meeting. So much for Christian charity. I have a son who is a heroin addict, and lives on the streets of Dallas Texas! He wants to come home, but I won’t allow it, even though my heart breaks for him. The problem that I hear from him, is he lost his ID card, and with out a Birth Certificate, with an actual raised seal, he can’t get help! I sent him copies of his Birth certificate but it wasn’t good enough to get an ID or any other kind of help. Every time I see these street people, I think of my son! No..I don’t hand them cash, but I do ask if they need a blanket, or, if they have an animal with them, give them dog food, but never cash! My son has told me how he lie’s and manipulates people, so he can get his next fix! I just ordered a new Birth Certificate and am sending it to the church closest to him, with their permission. Point being, without an ID, these people can’t get a job, food stamps, or renew their license, if they even have an expired one. These street people are pried on, having the little bit they have, stolen, which is my son’s case. It makes me sad that our government hasn’t figured this little fact out. How does a street person get an ID to prove who they are without an address? I know my son wants to come home, but until he’s clean and sober, I won’t allow it! Tough Love ? Yes, his age you may ask, 42 ! He’s been living on the streets of Dallas for over 6 years! I’ve helped him so many times,but I’m so close to just giving up! They seem to thrive in this environment, easy as long as they have their addictions are met, a little food in the tummy, and cash for ciggs or booze! I say, quit giving them money, maybe ask if the have ID, because with an ID, that will help them begin the start of getting off the streets. And the bottom line is, IF THEY WANT TO !!!!! My son has used the excuse, he didn’t have an ID, so for one last time, I sent him an actual raised seal birth certificate. May it be the first turn around and a start to getting his life back, and home to me! Our problem getting his Birth Certificate to him was , no address until an advocate of the church, who goes out and searches for these homeless, contacted me, asking if I could help my son by sending an actual Birth Certificate, which put in motion, this happening ! Sorry for such a long comment, I am a mother of a homeless son, a man at the age of 42, no excuse for him to be on the streets other then addiction, but after 9/11, getting an ID is nearly impossible, without a birth certificate, If you log on line how to go about getting one, it’s very easy, but it cost money, and the only people who can get a copy is a member of the family, with the applicant showing ID and what your relationship is to the person your applying for! Cost $20 ! If only things were made easy for these street people to get an ID, they could get a job, maybe renew their license or what ever else we require an ID for. Times have changed, some want to be out there, I just know my son wants treatment and without ID, No treatment! This is all food for thought coming from a mom who’s son is part of the street life! affordability of a roof over our heads! Praying for our veterans who are on the streets, they deserve better then this !! I am now retired but I was a case manager for 20 yrs. I was in contact with many patients who were homeless or in circumstances where they were not able to afford food. Most of these people it was due to drug addiction. There are also many that this how they make their living is panhandling, If you feel compassion for this person and feel the need to do something for this person I suggest you go into the store and buy them food. Do not give them money. Refer them to a social service organization.